Apparently old is gold for Nintendo fans! Nintendo’s newest 3D remake for the Legend of Zelda series is getting awesome reviews. Most reviews are higher than an 8 / 10, which may sway Nintendo to release more 3D/HD remakes. It seems like Majora’s Mask 3D is getting a great welcome from the gaming community. With Super Smash Bros. Wii U only a day away from release in North America, and only a little longer than a week in most other areas, reviews have started to come in from far and wide, and the general consensus seems to be that this game is absolutely amazing. 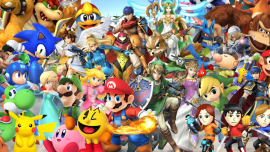 With reviews more favorable than nearly any other game this year, and tons of perfect reviews from a variety of gaming publications, it’s likely that Smash will be one of the best games we see in a long time. Despite the fact that Hyrule Warriors doesn’t officially release until next Friday, it seems many reputable sites and publications were given review copies of the game and have been permitted to publish them early. Nintendo is really pushing the Hyrule Warriors hype train, but does it live up to its expectations? Hit the jump to see what reviewers are saying! It’s no secret that Dynasty Warriors is one of Japan’s hottest sellers while Zelda has been struggling to keep ground there for a long time. Now the two series are getting together for a crossover extravaganza. But how exactly does the game fare in the eyes of Japanese gamers? To see the results of the Famitsu review, follow after the jump. With many fantastic reviews for A Link Between Worlds coming out, Nintendo of America has taken note and used the opportunity to send out a promotional tweet. It’s not much, but I’m sure everyone at Nintendo is as excited as we are to see an amazing game debut. Hit the jump to read the tweet! Skyward Sword: The Best of the Best?